Macao Post and Telecommunications Bureau will launch the thematic pack “Environmental Protection” on 1st December 2017. 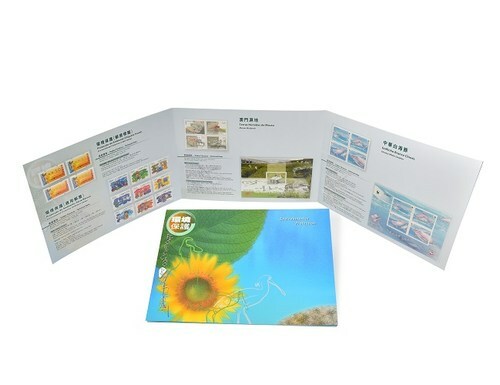 This pack comprises four stamp issues including "Environmental Protection (Definitive Stamp)" and "Environmental Protection (Label Stamp)" in 2002, "Macao Wetlands" in 2015 and "Chinese White Dolphin" in 2017, conveys the messages of actively promoting environmental protection, energy saving, and reducing emissions of carbon dioxide. This pack will be available for sale at the Philatelic Shop of General Post Office, “Rua do Campo” Post Office, Maritime Ferry Terminal Post Office, Airport Post Office, and the Communications Museum. The selling price is MOP150.00.